Human papilloma virus (HPV) is most commonly known to cause genital warts, but may also lead to cervical cancer, a significant cause of mortality in women. Despite clinical trials showing the HPV vaccine is safe and effective, vaccination rates remain low among adolescent girls (35 percent fully vaccinated, compared to 70-80 percent for other common adolescent vaccines). Parents report delaying HPV vaccination due to concerns about safety and fears that vaccination may lead to an earlier onset of sexual activity. Additionally, clinician beliefs and practice styles and adolescents’ infrequent health care visits may limit receipt of the HPV vaccine, especially since all three doses are required for full protection. We need innovative interventions to overcome these obstacles to vaccine receipt. Through our research, we aim to inform programs and policy changes that ensure these adolescents can receive care to meet their unique needs and, ultimately, transition to healthy, productive adults. For example, we’re investigating how using electronic health records may promote efficient workflows and provide automated support to families and clinicians during health decision-making. 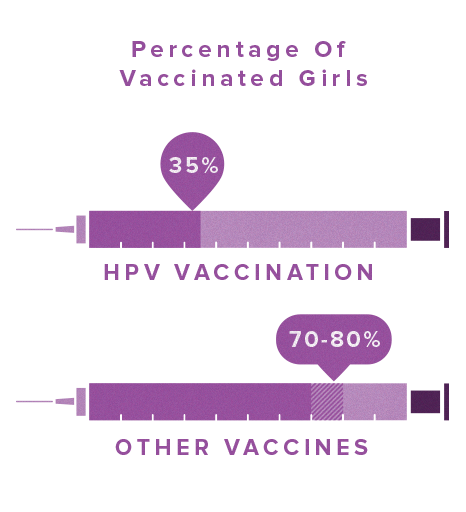 Only 35% of adolescent girls are fully vaccinated against HPV, compared to 70-80% for other common adolescent vaccines. PolicyLab developed a three-part clinician-focused decision support intervention (education, electronic health record-based alerts, and feedback), and a family-focused decision support intervention (automated reminder phone calls that also directed families to an educational website). In a one-year clinical trial, 22 primary care practices within Children’s Hospital of Philadelphia's Pediatric Research Consortium were randomized to receive clinician-focused decision support or not. Within these practices, 22,486 girls ages 11-17 who were due for the HPV vaccine dose 1, 2, or 3 were randomized to receive family-focused decision support or not. This resulted in four study groups: clinician and family-focused decision support, clinician-focused only, family-focused only and no support. We measured effectiveness of the decision support by comparing final vaccination rates and time to vaccination between the study groups. Decision support directed at both clinicians and families most effectively increased HPV vaccination rates. Clinician-focused reminders, education, and feedback were most effective for promoting the initiation of the HPV vaccine series, while the family-focused reminder phone calls supported completion of the vaccine series. Both types of decision support (family-focused and clinician-focused) accelerated vaccination uptake. The cost of implementing the most effective single intervention for each dose was low (≤$10 per additional girl vaccinated). 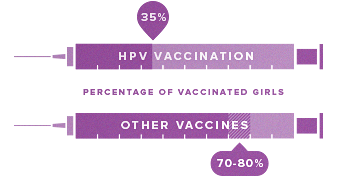 To increase HPV vaccination rates, it is most effective to engage both the family and the clinician. These results demonstrate how health information technology can be utilized to engage both clinicians and families in order to improve health and health care outcomes. PolicyLab has disseminated these findings both locally and nationally, seeking to assist other healthcare providers in boosting their use of the HPV vaccine. The Children's Hospital of Philadelphia, PolicyLab. How Can HPV Vaccine Rates be Improved? [Online] Available at: http://www.policylab.chop.edu [Accessed: plug in date accessed here]. HPV vaccine decision making in pediatric primary care: a semi-structured interview study.